Several web sites and on line magazines specialized in economics as well as paper journals have published the information about the EET project. Also links towards the EET portal were activated from relevant web sites and web portals. The university of Bucharest’s newsletter is the main information source at academic level. It is a weekly on line journal, which contains information about the academic life at university level. 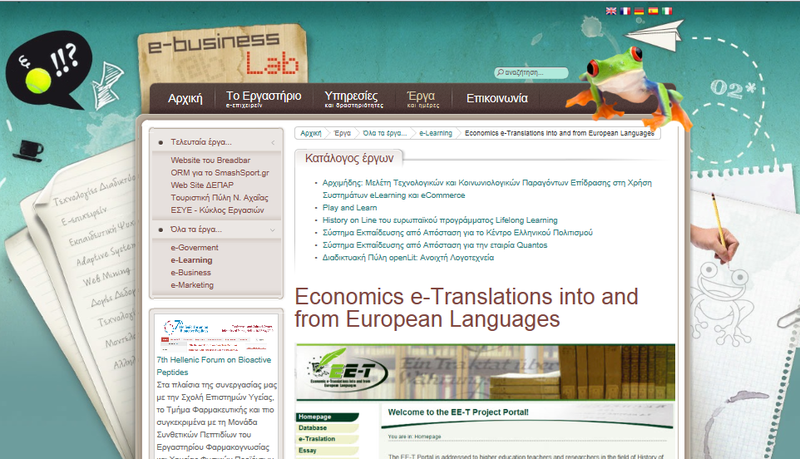 A description of the EET project and a link to the EET portal were published on the online Newsletter of June 2012. METU Library is a wealthy and powerful information and documentation center that has all kinds of modern technology and physical facilities accordance with the learning needs of the future and can offer the best service independently of time and space to its partners and manage to be a reference in its region.. A link to the EE-T web portal has been made from the e-Resources section of the web site. 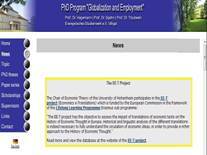 A news post has been added to the website of the Chair of Economic Theory at the University of Hohenheim, which informs students visiting the website about the scope and aims of the EET project and provides a direct link to the portal. The same information, including the link, has also been added as a permanent tab and reference on the Chair's website. EuroPlan is a web site focusing on European cooperation opportunities in the field of education, training, culture and research. 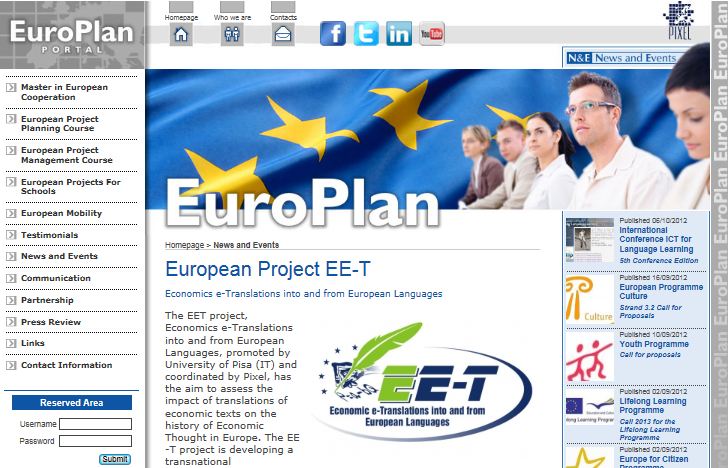 The information about EE-T and a link to the EE-T portal has been published on the News section of the EuroPlan portal. 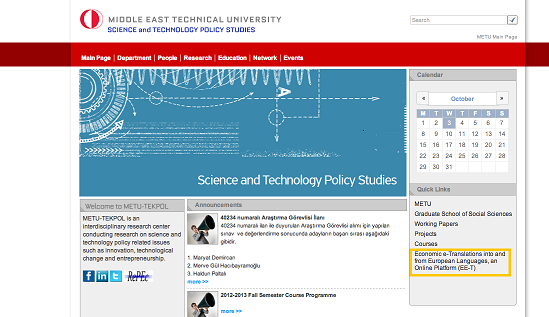 METU-TEKPOL is an interdisciplinary research center conducting research on science and technology policy related issues such as innovation, technological change and entrepreneurship. A link to the EET portal was published in the international projects’ section. Pisanotizie.it, is an online magazine presenting always updated information on the city of Pisa (Italy) and its surroundings. 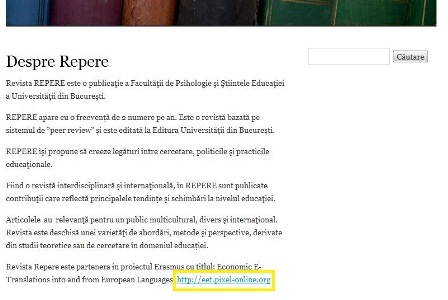 An Article entiled “A database of the classics of the economic thought translated in European Languages” was published on the online magazine presenting the EE-T project activities and expected outcomes. A link to the EET portal was also activated. 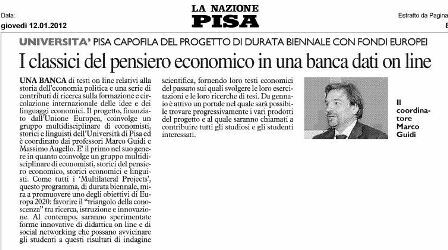 The web site of the University of Pisa, in the News section, published an article presenting the EE-T project. The information about the funding programme was provided as well as about the EET project activities and expected outcomes. A link to the EET portal was also activated. Pisainforma.it, is an online magazine focusing on the news related to the city of Pisa (Italy). 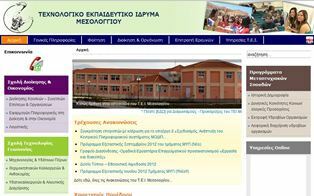 An Article was published on the online magazine presenting the EE-T project objectives, activities and expected results. A link to the EET portal was also activated. This web site provides information in the field of education, employment and research. 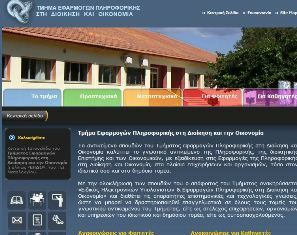 The portal is address to students and teachers who are resident in western Greece. A long and detailed article on the EE-T project was published on one of the main web pages. This Messolonghi News web site provides information focusing on Messologhi city in Greece and the surrounding area . An article on the EE-T project was published on one of the main web pages providing information about the project target groups, aims, on going activities and international partners involved. 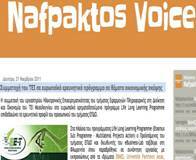 Nafpaktos Voice is an online magazine web site provides information mainly related to relevant news in central Greece . An article on the EE-T project was published on this online magazine pages providing information about the project as well as a link to the EE-T web portal. An article on the EE-T project was published on pp. 41-42 of the March 2012 Newsletter of SISE - Società Italiana degli Storici dell'Economia i.e. the Italian Society of Historians of Economics. The article presents the aim of the EE-T project, its duration, its methodology and its transnational approach. 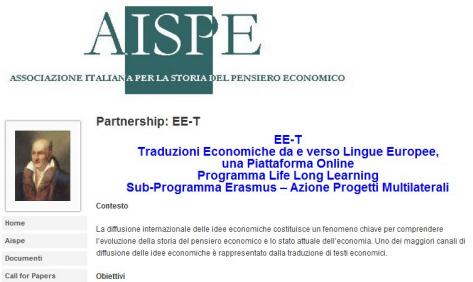 An announcement of the EE-T programme is published in issue n. 1 of the newsletter of AISPEB - Associazione Italiana di Studi Portoghesi e Brasiliani i.e. the Italian Association for Portuguese and Brazilian Studies. The article contains all the relevant information about the project and the link to the EET project web portal. 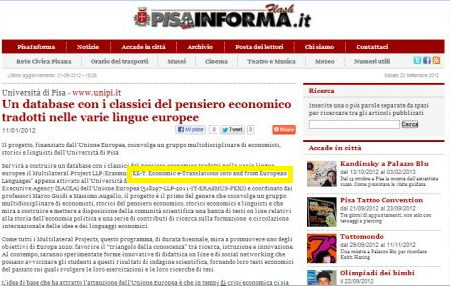 Il Tirreno is an Italian newspaper distributed in the Tuscany region on 14 January 2012 published an article on the EE-T project entitled European Economy, history revival through a database. The article presents the main information about the EE-T project and its transnational partnership, as well as its objectives and purposes. La Nazione is a newspaper distributed in several regions of central Italy. 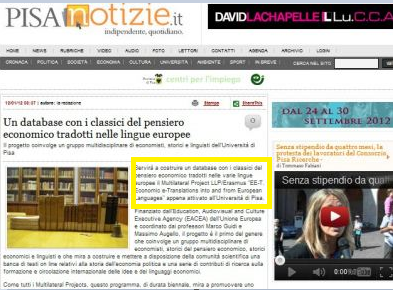 On 12 January 2012 the newspaper published an article on the EE-T project entitled The Classics of the Economic Thought in an online Database. The article presents the main information about the EE-T project, its objectives and approaches. “L’Unità” is a national newspaper it sells around 40.000 copies yearly. 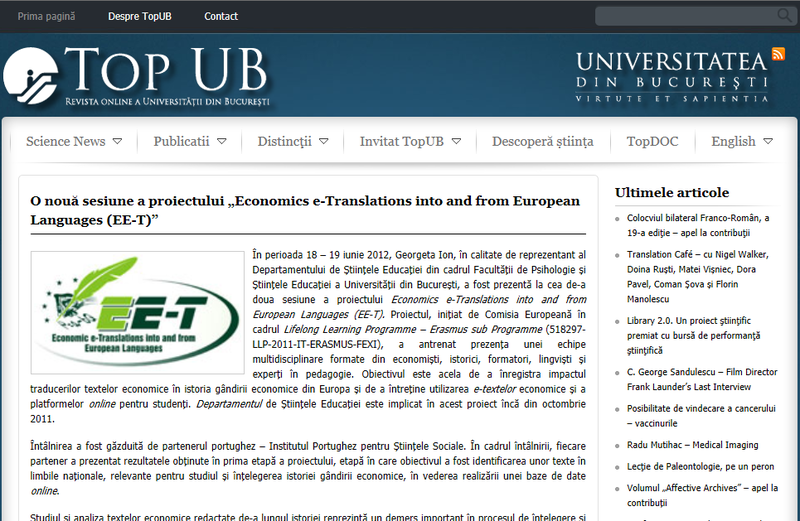 On 12 January 2012 the newspaper published an article on the EE-T project entitled University, Economic Thought collected in a single Database. The article presents the main information about the EE-T project, its activities, partnership and purposes. Top Ub is an online magazine published by the University of Bucharest providing relevant information for students, researchers and professors on the university. A detailed article on the EE-T project as well as the link to the EE-T portal were published on the TopUb magazine. 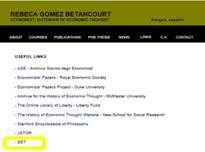 Rebecca Gomez is an economist and an historian of economic thought. Her web site provides sources and information for students and researchers in the field of economics and analyses the international economic processes. Under the Useful links section, a link to the EE-T project portal was placed. The web site of the Faculty of Psychology and Educational Sciences of the Bucharest University contains all the information related with the study programmes offered by the faculty and the projects carried out for the faculty members. A link to the EET portal was published in the international projects’ section. The Centre for Economic Theories and Policies of the University of Sofia published in the News section the information about the EET project as well as a link to its web site. The University of Sofia is also an associated partner of the EET project. An article illustrating the teaching and learning potentialities of the EE-T Database of eTranslations has been published, in April 2013, by “REPERE - Review of Educational Sciences”, a an academic journal which aims to promote the research and innovation in education. The target includes educational specialists, teachers, students and everyone who is interested in this theoretical domain. Thanks to high number of readers, the information about the project were highly spread and the project obtained a great visibility.